Island Culture Archival Support (ICAS) is a nonprofit organization dedicated to the preservation of records pertaining to the cultural identity of island peoples in Melanesia, Micronesia and Polynesia whose national and public archives, libraries, cultural centers, and business organizations are underprivileged, underfunded, and understaffed. The specific purpose for which this nonprofit corporation was formed is to support the needs of these Pacific Islands cultural heritage institutions by helping to preserve and make accessible records created for business, accountability or cultural purposes. The organization will endeavor to add value by providing resources or volunteers to advise, train, and work among island residents to support their efforts in building their future and preserving their collective memory through the use of modern archival techniques. Download the ICAS Brochure in .pdf format (2.8 MB). Just-released: Pacific Islands’ lore by Brandon Oswald! Mr. Moonlight of the South Seas describes the adventurous life of American author Robert Dean Frisbie, who lived in the South Seas from 1920 until his death in 1948. Although he is part of a long line of South Seas writers that began with Herman Melville and Robert Louis Stevenson, Frisbie managed to do what very few of these writers could do — after going to the Pacific, he stayed there for the rest of his life. He first arrived in Tahiti, French Polynesia, where he met author James Norman Hall. The two would remain friends for the rest of their lives. Hall and Charles Nordhoff wrote Mutiny on the Bounty and later the Bounty Trilogy. After four years in Tahiti, Frisbie left for the tiny atoll of Pukapuka, Cook Islands, where he hoped the solitude would enable him to write his masterpiece. Frisbie embraced life there; he married, had children and lived a life completely different from those of his American contemporaries. He was also a contemporary of James Michener. Frisbie’s writings would put Pukapuka on the map and his adventures would become the stuff of Pacific Islands’ lore. 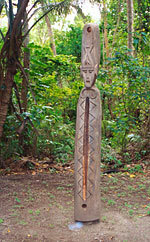 "Preserving the Heritage of the Pacific Islands."